I’m sure we’ve all eaten fried rice at least once in our lives—probably from our favorite Chinese takeout restaurant as a Friday evening treat. But have you ever tried making it at home? This simple video shows you how to transform your boring leftover rice and vegetables into a delicious and flavorful Chinese dish, favored by millions around the world. Heat vegetable oil in a frying pan over medium-high heat. Add soy sauce and cook until it bubbles, then add eggs and mix to scramble them. Lightly season with salt and pepper, and remove from the pan when they are cooked halfway and not completely solidified; set aside. Heat a little more vegetable oil in the frying pan over high heat. Cut green onion into thin slices. Add cooked rice to the frying pan and sauté until it is piping hot. Add the green onion, egg, and chili flakes, season with salt and pepper and stir to combine until everything is hot. Check out the accompanying video for the full recipe, and enjoy! The beauty of this dish is that you can easily make it your own, as the ingredient and flavor possibilities are endless. 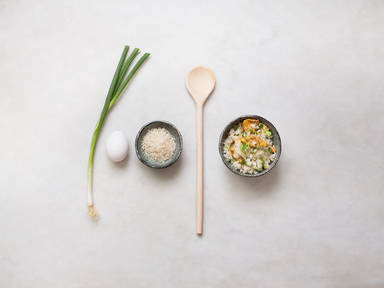 Here we have provided you with a base recipe for fried rice, but you can add a variety of whatever other ingredients you may have lying around in your fridge. For example, leftover cooked strips of beef go very well when added to the rice with some diced carrot, and cooked chicken goes very well with a splash of hoisin sauce and peas. Go experiment and you’ll soon find your favorite flavor combination!